I am going out on a limb here and trying something new for the forum.......I believe that it will be a benefit for everyone. This is something that anyone here can do, and that I wish everyone here would do. I belong to a couple of other forums where Works in Progress or WIPs are quite prevalent. One is Ford Torino owners website where members show their WIPs on their cars that they maybe restoring or simply doing work on. Another site is model car website geared towards racing competition cars....the WIP's there show the start to finish on a project and what it took to get there. A WIP encourages input not only from the original poster , but from members who are able to share their knowledge and expertise as well. I cast parts and pieces for scratch building model stock cars, but that doesn't mean that I cant gain knowledge from someone who cast fishing lures or pen bodies. A WIP is not a one sided post from the original poster...for the thread to thrive it takes input from others....even if its a thumbs up, good job. 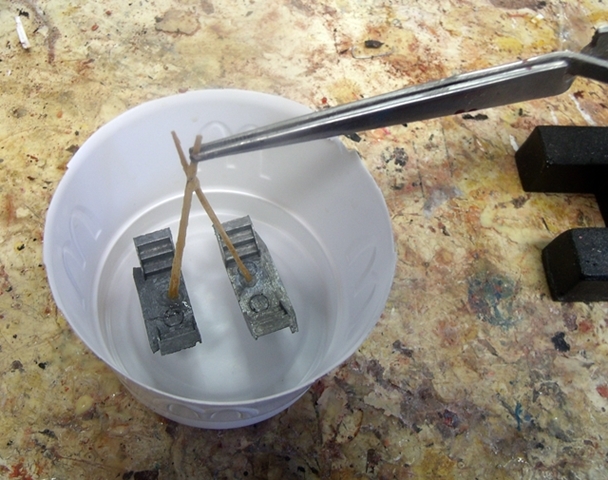 This WIP involves casting a set of H.O scale (1:87) Silver Streak passenger car/caboose platforms. These platforms are at least 50 years old and extremely brittle. One platform has developed a crack in it which could make demolding it a difficult challenge. It feels like they were originally cast with some sort of soft metal. I'm doing this project for one of the "'ol railroaders" Tony Fox from the local hobby shop that is the mecca for model train hobbyist. These platforms come from a kit where the rolling stock is put together in the same fashion as a model kit is put together. These are the platforms, the one has developed a crack, so making a mold is a must to preserve these platforms in resin. Tony scratch builds rolling stock (train cars) and he likes the look of these particular platforms which he will be able to use on passenger cars and cabooses. 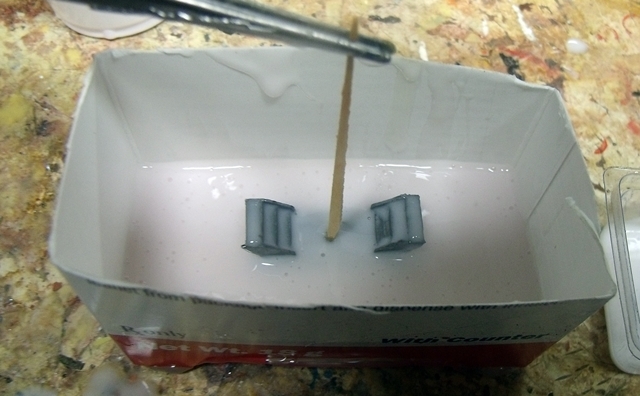 I attached toothpicks to the bottom of the platforms with CA (super glue) and then glued the toothpicks together. 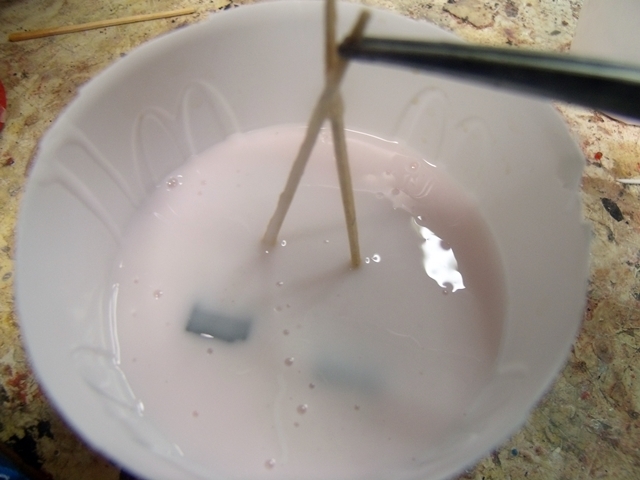 The holding device has come in quite handy with resin casting as I am able to suspend the piece being cast in the mold. This mold "box" is nothing more than the bottom portion of a large size McDonalds plastic soft drink cup. Everything is aprox. 1/4" apart...1/4" above the cup bottom, 1/4" away from the sides of the cup and aprox. a 1/4" between the parts to be cast. There is a mark on one of the toothpicks that is 1/4" above the platforms. A 1/4" insures that the mold wont distort, yet flexible enough to demold. Used up what I had left of some HS-3 and made a mix that ended up being aprox. 1/3rd HS-2 and 2/3rds HS-3 (87g total by weight) added 9g of catalyst....not expecting any issues, fingers crossed. This is going to be a partial rubber pour so that I can allow the air bubbles to come to the surface and pop since RTV bonds to itself anyway. 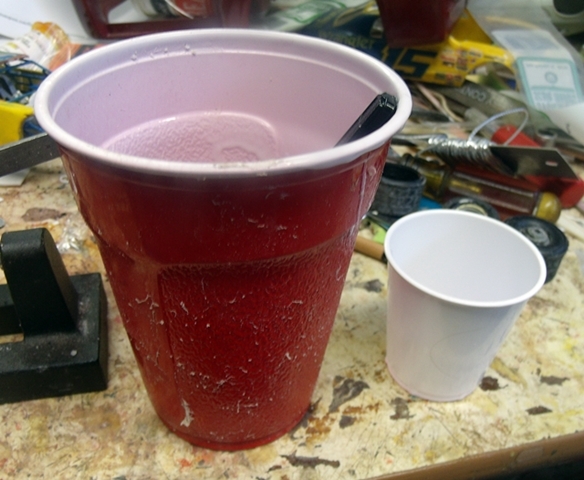 I use the smaller Dixie bathroom cup to pour and weigh using a Gram scale and the Red Solo cup to mix in..... seen them used for mold forms as well. Save the plastic ware that you may get from the drive thru or carry out, its quite useful for stirring. That's it for right now, more to come! ....it's been over 24 hr's later and my RTV rubber mold is still tacky....How many times has these words been uttered here??? a few... well guess what, it has happened to me. I'm not complaining, but rather I am going to make this a teachable moment. I believe where I erred first is that I did not shake the catalyst bottle well before mixing with the 2nd. pour , but on the other hand I cant recall with any certainty that I did it with the first either....my bad. The catalyst is some that was left over from the last batch of HS-3 that I purchased from some brick and mortar store over a year ago...so no telling its actual age. It did , however, still have its original Pinkish/Red color and fluid consistency. I did the pours in the hobby room where it is a pleasant low to mid 70's of central air comfort with relatively low humidity. First order of business after almost 32 hr's is to move the mold outside where it is hot and muggy......right now at 8:30p.m its 85 degrees w/ 48% humidity...its going to camp out over night and tomorrow (MON) its going to be exposed to temps. in the upper 80's and humidity levels during the day anywhere from the mid 50% range to the upper 40's% range. If after all of that, and its still got some sticky to it , I'll lightly dust it with some baby powder.....I just need it firmed up enough to extricate the master pieces. Hopefully the Squirrels don't think that I left them a cupcake outside and try to eat it. 9 times out of 10 I forget to shake the catalyst myself and have used unknown age HS-3 myself so I know it does come out fine after it hits full cure most times. I'd like to know how this came out if you don't mind? When my molds (HS-2 & 3 and Plat 25) are still a little tacky but firm enough to de-mold I go ahead and de-mold then hit them with either the hair dryer or the "steam" method if it's too nice outside to let the weather work for me. Being exposed to daytime highs in the upper 80's to low 90's and day time humidity ranging from the mid 30% to mid 40% yesterday and today has eliminated any stickiness and has firmed the mold up some.....I think one more day (tomorrow) of the same temps. 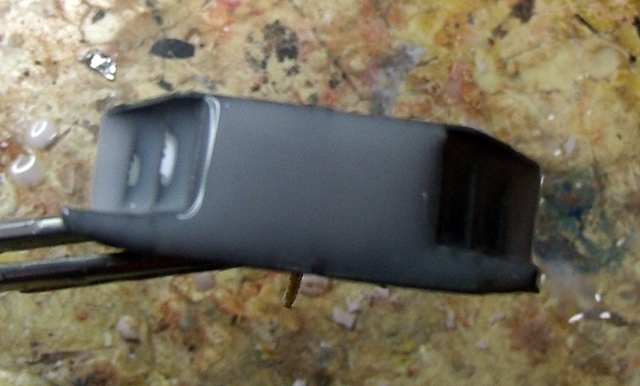 and humidity %'s will have completely cured the mold making it firm enough to proceed with the next part. If this makes any sense......, when I first placed the mold outside Sunday evening it was mushy, almost like that fake slimy snot stuff....yesterday evening after work I noticed that the stickiness was gone and it had firmed up a little bit, but not enough to be anywhere near enough to call it good. 1) AWAYS shake the catalyst bottle ...even it seems like an excessive amount and duration....even if its fresh out of the box and just arrived on your door step from Alumilite. 2) Since the HS-2 RTV silicone rubber has a 45 min. work time (HS-1 and HS-3 same) stir/mix in the catalyst as per the directions for at least a couple of minutes or more. 4) Hot and humid ambient air is better for curing that cool, dry ambient air. I may take this into consideration and plan my mold building accordingly...i.e outside weather conditions vs. a temperature and humidity controlled indoor environment. I have done molds in the dead of winter...I want to say the last successful time that I did this the cure time was more than 18 but less than 36-40 hours. With a tin cured silicone it does require moisture for proper curing. With an excess of humidity it can accelerate the cure of a tin cure silicone. Humidity does not have any effect on platinum silicone cure schedules, but heat can help accelerate the cure on platinum silicone. Shaking the catalyst is important it can separate especially if it has been stored. Thanks for sharing your post with a "WIP" project, it was really cool! I have learned a lot from many on here who have tried different applications with their own ideas on adding something new to an old technique. With both successes and failures... either way there is typically something learned. Good news, the heat and humidity did the trick, made the mold nice and firm...bad news...broke both the platforms de molding them and noticed that air bubbles got trapped underneath the platform ruining an other wise good mold.....even poured along the edge and about 6" above the "box" and allowed the rubber to flow into the masters. The platforms are made of a soft metal and are at least 50 to 55 years old...they are brittle....I can put them back together w/ CA. I will make another mold, only this time I will not have them flat, but rather on end...the part of the platform that goes up against the car body will be down....that way any air bubbles that get trapped wont affect the visible portion of the platform once it is put in place....fingers crossed that they survive a second de molding. O.K so things didn't turn out like I planned...in the future, if I don't think that the master wont hold up to being de molded, then I probably wont be casting it.....unless of course it doesn't matter whether it comes out in one piece or not. Like the line from the movie Apollo 13 "Failure is not an option"
Another option to having to just toss the mold (something I hate to do) is if you have some Amazing Putty on hand is to mix up a pinch amount (teeny tiny amount) and smoothing it in the bubbles, I've done this with good results before. That is of course if the bubbles are in a spot you can reach. 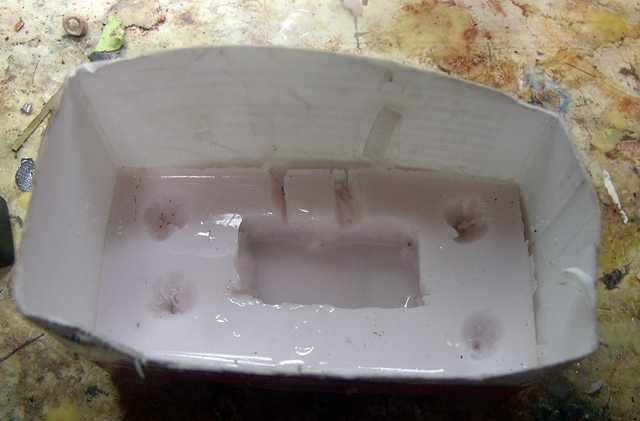 Since it was a one piece mold there was no way my big fingers could have smoothed in the bubbles with Amazing Putty. The bubbles where in a spot that I could not reach. I have decided to make this into a 2 piece mold....reason being is the stress on the original piece to be cast (de molding)...been doing some research on the metal that was used to make these parts 50 - 60 years ago.....seems that if the piece is kept from bending, even a very minimal amount, it will be o.k , but if it gets tweaked, even the smallest amount, it starts fatiguing thru out the piece. Needles to say it would hardly take anything at all to break a piece off. Then good idea to do a two piece - don't forget the release spray so the sides don't stick together (done that myself). I've got small fingers but I also have some tiny ended tools I use and still can't get in some spots. 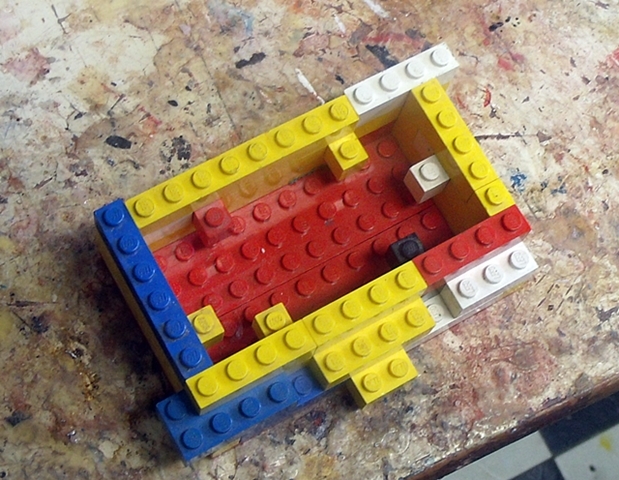 If need be, a three or four piece mold might work too (been there, done that). I like to use Remelt (and a release spray) instead of clay for the bed to get the first half. Also I noticed that there's a Trans 40 mold type now that lets you see through it - if you want to and can lay hands on some, I'd use that simply because you can see through it and will be able to see the master. Sometimes seeing what you're doing helps too. 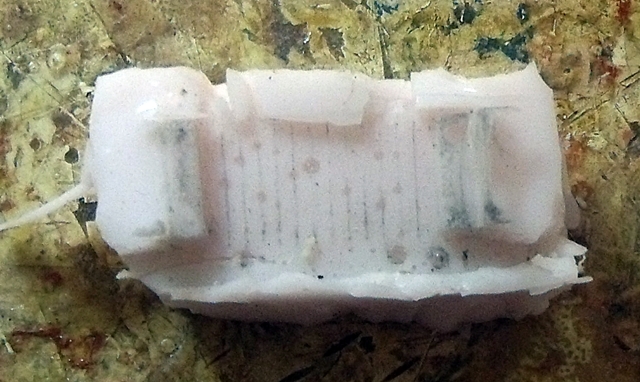 ....been working on the mold...seems like its 3 steps forward, 1 step back. To achieve this all I did was to shake the catalyst for aprox. 1 min. and mix the RTV Silicone and catalyst for 2 minutes and pour. Going to go with a 2 part this time to help take some of the stress off of the original as it(the original) is becoming more and more unstable. Found a small box and cut it down and sealed it w/ hot glue. 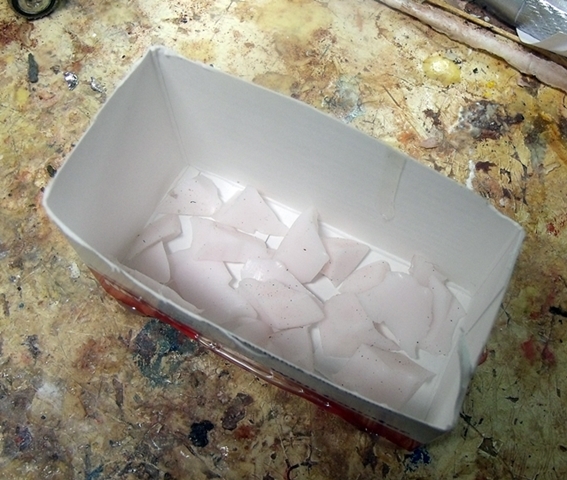 Cut the original mold up into small pieces for back fill in the mold box. Pour the rest of the RTV Silicone up to what would be the flat part of the platform...used a toothpick to work out the air bubbles and work in the Silicone. Had a spare master piece to cast standing by just in case there was any extra Silicone and there was...this will be a 2 part as well. Hacked and cut the bad section out of the mold....cut the alignment lugs and carved out the grooves for the vent and gate Started refilling the void with Silicone. This time I brushed the Silicone on...notice no bubbles this time. I am going to let it dry like this before setting it up in the 1st part of the mold. Don't forget the release spray between the two halves so they don't stick together where you don't want them to. Looks good so far, I hope it behaves for you, I'd like to see the copies it makes. 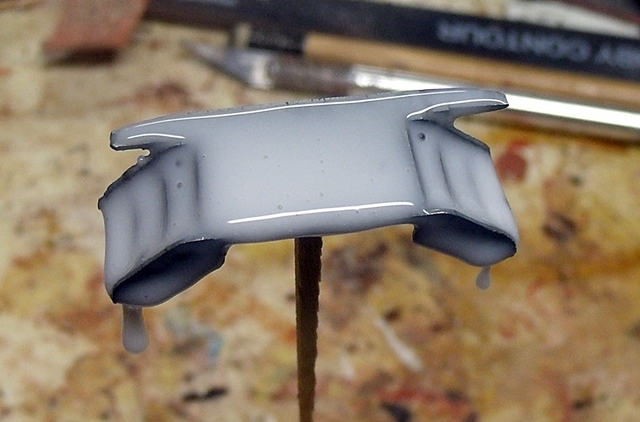 And I have done the "cut up the bad molds to use as filler" thing with the liquid silicones too. I had two bad molds (bad rips and one part came completely off during de-molding) in the Plat 25 (no fault of the Plat 25, it was due to the design being copied being a pain). 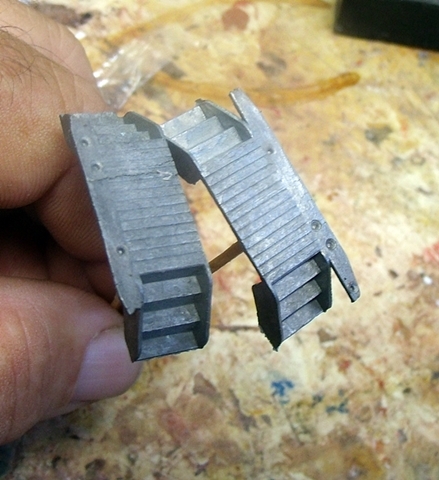 I like that you can cut up the bad molds into tiny pieces and use them as filler in new molds. Just as long as anything that can contaminate the mold is tossed and not added. I hate to waste the good stuff and then just have it laying around, especially since all it takes is some time sitting down to cut them up for filler and I have the time to do it. There is a trick to using filler - pour a small amount of new, tap a little, sprinkle filler, tap a couple times, then add more new to fill and tap a little bit more. Doing the same thing over and over again expecting a different result each time. At least you can salvage the mold for something. If nothing else, cut it up for filler for another mold. And we've all made big boo-boos. I've been known to completely forget the release between the two sides and have had to carefully cut the master out. And I have also realized while I was pouring the second half that I forgot the release and had to quickly pour it back off and hurriedly clean off what I can and apply the release then poured the second half over that. Thankfully, the molds have a longer open time which has saved me before. I've also screwed up and under catalyst-ed a mold and had to clean the resulting mess off resin castings with tiny lines - talk about a mess! ....The trials and tribulations of a WIP....hopefully some one is learning on what not to do by the mistakes that have been made.....I've tried to keep it as brutally honest as possible. The 3rd time is the charm...right??? Found my Legos !!! The portion of the blocks that are towards the inside of the box will form the alignment lugs. Need to seal the 2 halves that make up the bottom flat part as I can see a sliver of daylight between them. Yup, it's very honest and helpful. I'll keep my fingers crossed for you. I saw some off-brand ones at Dollar Tree the other day and thought about getting some but was in a rush do I didn't. And now I see a very good use of them.